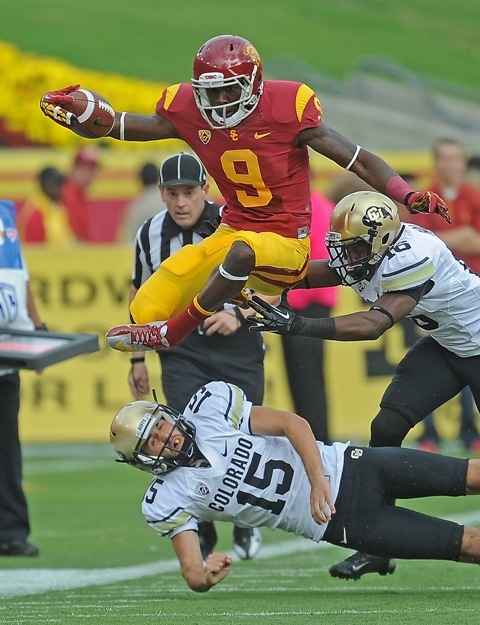 Marqise Lee was voted the Pac-12 Offensive Player of the Year by the conference’s head coaches. He was the only player selected on the first-team by all 12 head coaches. Lee set new Pac-12 single season records for receptions (112) and receiving yards (1,680). He also scored 14 TDs. Khaled Holmes was selected to the first team offense and Robert Woods was selected to the second team offense. Matt Barkley, Xavier Grimble, John Martinez, Silas Redd and Max Tuerk received honorable mention for offense. Morgan Breslin, T.J. McDonald and Nickell Robey were selected to the second team defense. Marqise Lee was selected to the second team special teams. Other Trojans receiving honorable mention were Dion Bailey, Tony Burnett, Andre Heidari, Wes Horton, Kyle Negrete, Hayes Pullard, George Uko, and Leonard Williams. Leonard Williams was also named Freshman Defensive Player of the Year. He finished the season with 7.5 sacks, 13 tackles for losses, 50 tackles (30 solo), an interception and two fumble recoveries. Click here to check out the entire list of players honored.